Our bodies change food that we eat into sugar (glucose). Insulin (produced by the pancreas) helps to process this sugar. Low levels of insulin is the problem causing this condition. 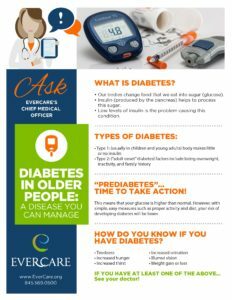 “PREDIABETES”… TIME TO TAKE ACTION! This means that your glucose is higher than normal. However, with simple, easy measures such as proper activity and diet, your risk of developing diabetes will be lower. IF YOU HAVE AT LEAST ONE OF THE ABOVE… See your doctor! THE GOAL IS TO KEEP DIABETES UNDER CONTROL. THE GOOD NEWS: WITH PROPER MANAGEMENT, SYMPTOMS CAN BE LESSENED, CONTROLLED, OR EVEN ELIMINATED! Track your glucose (and A1C) levels. Make healthy (and tasty!) food choices. *Even if you do not have prediabetes or diabetes, moderate exercise can lessen the risk of developing it by 40 percent. Check your A1C twice a year. Have yearly eye exams (optometrist or ophthalmologist). Check your kidneys yearly (urine and blood test). Get flu shots every year and the pneumonia vaccine. Keep your skin clean and moist. Look at your feet for sores or infections and visit your foot doctor annually. Reduce stress and increase relaxation. WITH SIMPLE, EASY MANAGEMENT, YOU CAN CONTROL YOUR DIABETES AND LIVE A FULL, ACTIVE LIFE!